Il Best Western El Grande Inn è situato nel centro di Clearlake. L'hotel è vicino alle principali attrazioni turistiche. Approfittate tutto l'anno del miglior prezzo garantito e di offerte esclusive. Vieni a goderti lo splendido scenario della California settentrionale soggiornando in questo hotel confortevole di Clearlake, a pochi minuti dalle aziende vinicole della Napa Valley e dal bel lago Clear. Viaggiatori d'affari e turisti si sentiranno come a casa nel Best Western® El Grande Inn. Gli amanti delle attività all'aperto si troveranno a pochi minuti dal lago Clear, il più grande lago d'acqua dolce dello stato, dove pescare e praticare sport acquatici. I golfisti potranno trascorrere un pomeriggio all'Hidden Valley Golf Course, a solo una breve distanza in auto da questo hotel di Clearlake, mentre gli appassionati di cavalli apprezzeranno il Lake County Rodeo. Gli ospiti del nostro hotel di Clearlake adorano anche visitare la famosissima regione vinicola della Napa Valley o rilassarsi facendo i fanghi nelle vicine terme di Calistoga. 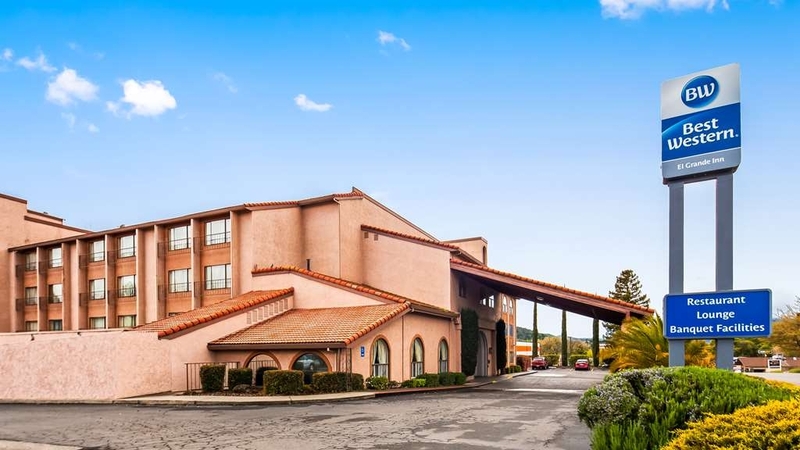 Questo hotel BEST WESTERN di Clearlake offre la sistemazione ideale per gli amici e le famiglie che visitano gli studenti del vicino Yuba College o i pazienti del St. Helena Hospital. Inoltre, con ristoranti e strutture per banchetti all'interno dell'hotel siamo un luogo d'incontro e uno spazio per eventi ideale a Clearlake. Siamo il solo hotel a servizio completo di Lake County. le nostre comode camere dispongono di televisori a schermo piatto da 37 pollici, accesso wireless a Internet gratuito, frigorifero e microonde. Tutte le camere danno sul nostro atrio adornato di piante rigogliose attorno a una rilassante fontana e alcune suite offrono viste mozzafiato del lago Clear. Per rendere il tuo soggiorno ancora più piacevole, gli ospiti di questo hotel di Clearlake sono invitati a godersi un pasto abbondante o un cocktail nel nostro ristorante interno e a fare una nuotata nella nostra piscina al coperto conidromassaggio. Vieni a scoprire di persona perché il Best Western El Grande Inn è stato classificato una struttura a tre diamanti AAA. Prenota oggi stesso! "Very nice staff, very clean!" Although it is evident that the hotel is older, it is one of the cleanest places I've ever stayed. The room was immaculate! The staff were very nice and accommodating. The restaurant didn't have good lunch food, but we didn't try any other meals there. The showers have very low water pressure, but they worked ok and were clean. I will always choose this hotel when I go up to the area. Your response is very important to us. We thank you for your good rating and your excellent review and look forward to your next visit with us. Check in was painful, as definitely the employee was not having a good day. I first called explaining the BW website was not working, would she honor the online price once we arrived. Answer was no, even though, as she said there were lots of rooms available. Once arrived, and every time we passed, she was sitting on a chair in the corner on her phone. Showed her on my phone the website was not connecting, she did not offer the lower AAA price. Rooms clean, but so very old. Beds comfortable. Morning check out employee very apologetic, promised to correct my bill but have seen no change. We will not stay here again, unless desperate. Stayed 1 night. Found property to be dated but clean. Nothing to bad, but nothing exceptional either. Third floor room was non-smoking, but must have been a smoking room at one time, because had old ashtray odor... Restaurant onsite was about the same, nothing exceptional or bad, just OK. Reception and checkout was smooth, no issued. Also, plenty of local eating options nearby. "At This Price, It's A 5 Star"
Let's face it, this is not an upscale area. Given that qualification, at this price this was a room worth 5 stars. The room's layout is on the model of the Embassy Suites with a living room, bath, and bedroom. The room was clean and quiet. We would stay here again. Thank you for taking the time and posting your rating and review which is very important to us. We thank-you for the 5 star rating and the excellent review about the hotel. 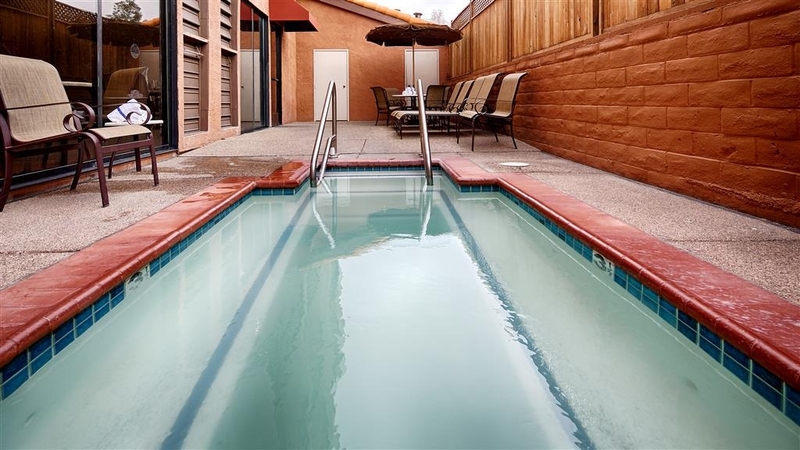 Should you be blessed with a room on the back wall, just know that you're positioned directly over the pool and hot tub. These areas do not close until 11pm. So if you are a person who values a restful night, you should probably pack ear plugs especially during holiday party season when drunken debauchery and decibel levels tick upward as the night progresses. However, the staff is terrific. The food is surprisingly decent and the rooms are clean. We value your response and feed back. We are sorry to hear about the noise was so close to your room. But thank you for the positive feedback about our staff, restaurant and mentioning about the cleanliness of our rooms. We hope to see you on your next visit here. "Horrible experience! We are never setting foot in a Best Western again!" First disclaimer: This was in July 2017. Tripadvisor did not let me choose a date before a year ago but this review is so important for me I am going to risk bending the rules, since this was the worst experience we had ever had in a hotel in our life! First of all the hotel is old and run down, second the room we got had bad cigarettes smell since it was on the 1st floor which is right next to the bar where the lady bartender was smoking. Mind you this was a non smoking room we ordered! When we asked to change rooms because of the smell we were told the hotel is fully booked and when we asked to cancel reservation they said there is no option of getting money back at last minute notice. They offered to spray some cleaning soap around to make the smell better... It was ahwful stayong in that room but we realy had no choice but to stay and goble it. Then the power outages began! - it was a VERY hot July weekend so the city couldn't handle lots of ppl using air-conditioning... The hotel did not have a backup power system! During the outage my husband got stuck in the elevator! The fire department came but couldn't let him out without ruining the elevator, since it was such an old one, so they just waited until the power come back, so my husband was in the elevator for half an hour while our child was crying histerically because she was worried about her dad, and it was very hard to cam her down. At this point I thanked god it was the last night of our trip and we are back home tomorrow. No money back was offered for this terrible experience. They did gave us 10% off after contacting the hotle manager who wasn't on-site. We thank you for your review which is very important to us. We are very sorry to hear about your experience here. 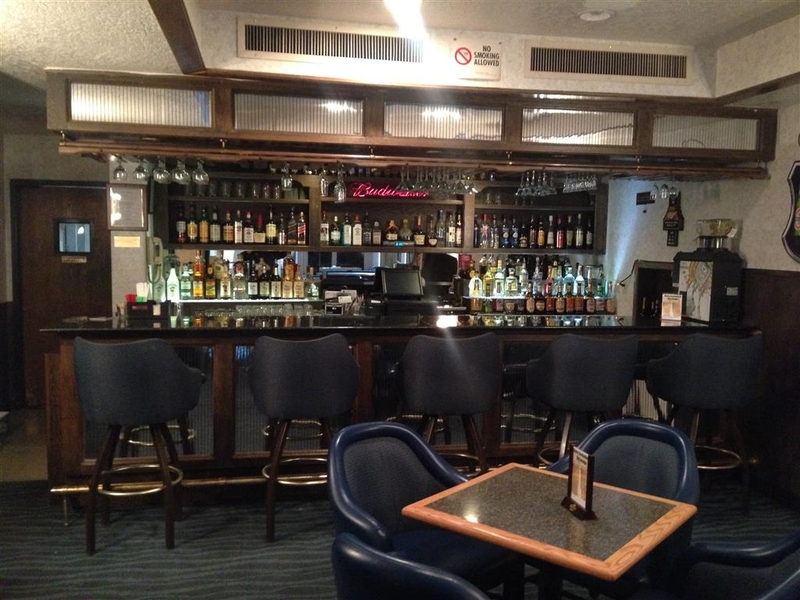 Currently our bar is a non smoking bar and it is illegal to smoke in the bar by California law, so I know that experience won't happen in the future as long as the law stands. So even though your weren't in our enclosed bar and appearantly you are saying that the smell of smoke made it to your room on the first floor, then we apologize for that. I see that the staff did try to make your room not smell like smoke but it sounds like it wasn't satisfactory for you and once again and we apologize for that. Also dealing with the power outage, the hotel and the city has no control over that. This is strictly a PG&E controlled situation. And it is true, us like almost all other small businesses don't have a back up power system to handle all the needs that a hotel our size with all of our rooms and restaurant, and swimming pool and spa and fitness center for a situation which normally doesn't happen (thank goodness) for the very expensive system it would cost to put in. Our staff did call emergency responders as you have mentioned but it was decided by them since this was not a life or death situation to wait for the electricity to come back on. I am sorry to hear of this unfortunate timing of using the elevator when this situation occurred and upset your child with your husband in the elevator. I see that you mentioned that no money back was offered, but in the next sentence you said that you were given 10% off of your room. Once again thank you for your feed back and giving us a chance to address this review. "A nice respite after a long day of travel"
Despite the bland exterior the interior of the hotel is beautiful and the game-room is great. The rooms are clean and very comfortable. My only (very small) complaint is that although the restaurant food is good (and clean restrooms!) the breakfast is not complimentary. We thank you for taking the time and giving us a nice rating. Your comments in your review is very important to us. We are delighted you enjoyed your stay with us, and look forward to your next visit. Nice hotel. Good rates. We got a suite. The lake view really isn't that great. You can barely see the lake. Great view of taco Bell and auto zone. haha. The pool bottom looked rough, so we passed on that. The jacuzzi door was locked. Nice restaurant inside. Pretty good food. Bed was pretty comfortable. Water pressure in the shower is terrible. Wanted to take a bath and took a half hour to fill the tub. Almost got plowed over by maintenance. We were coming out of the elevator, and as soon as the door opened, and we went to walk out, he come pushing through with some cart full of tools. He needs to be taught how elevators work. Some rough looking people wandering around the parking lot. Digging in the ashtrays, and passing through. Made me a little nervous. No breakfast included. But the restaurant is open for purchase. It was a pretty good stay. Thank you for your nice rating and your review. I am sorry to see that our pool was not inviting and when the door is closed on the Jacuzzi that just means that we were treating it for a couple of hours. Glad you enjoyed are new beds, but I see that day the water pressure sounds like it was low and we apologize for that. We will let the maintenance man know of your comment also. So we are delighted all in all as you said "It was a pretty good stay." Staff was excellent and the room was very nice. Loved havving a restaurant as we could have breakfast and dinner. Nice alfter a long day to be able to have some cocktails with dinner and not have to drive. We thank you for taking the time to write a review and give us a rating. Giving us a rating of 5 is super and we appreciate that. Also mentioning about our staff that was excellent and that the room was nice. We are delighted that you loved the restaurant and enjoyed the fact we have a full service bar to offer you cocktails with dinner. This is the best hotel that I have found in Clearlake. Dawn is always very helpful when I stay at this hotel, she makes check in and check out very easy and quick. The rooms are clean and the the beds are comfortable. If you're traveling Lake County, consider this motel. I stayed for 2 nights and it was clean, quiet and close to the lake. It was a really nice place to stay. If only there was breakfast included, it would be a great place to stay. Thank you for your great rating and great review, and I hope it was a super fun 60th birthday for your friend. 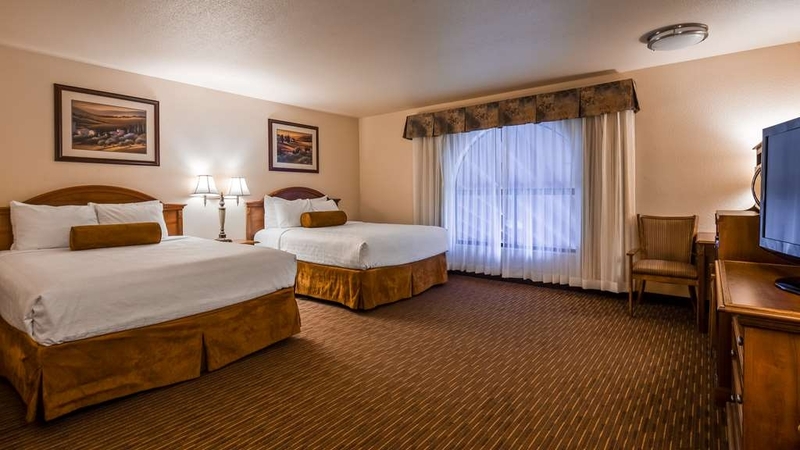 "Best place to stay in Clearlake"
This place is wonderful the rooms are great and the staff is even better especially Dawn at the front desk and Susan and Sabine who are waitresses in the restaurant. If you want to be treated like royalty this is the place to stay!!!!!!!!!! We thank you for your great review and the mentioning of our staff at the desk and restaurant. We look forward to serving you on your next stay with us. 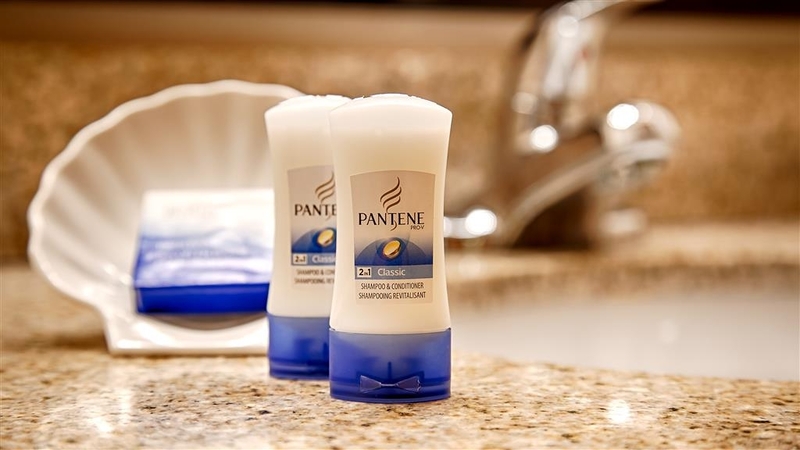 Clean, friendly, great amenities. Restaurant on site, weight room, pool, atrium is great for group mingling. Location is great for locals to celebrate special occasions. Great as a business meeting location, self contained and centrally located. Room was very nice bed very comfortable. Has restaurant on site had breakfast but expensive for what we had. They did not have the usual free continental. The pool was small but we didn't use it. The first night there were kids in the spa and you could hear them. There was a man? In the next room that was coughing or something that we could hear quite clearly. Overall nice place. Would recommend. We stayed one night here on a two week trip. The only hotel in town.The room was clean. The desk staff was courteous. This is the first BW we've stayed in that didn't provide a free breakfast. They had a restaurant in the hotel and we had to pay for breakfast. Nothing exceptional and we've stayed in better. 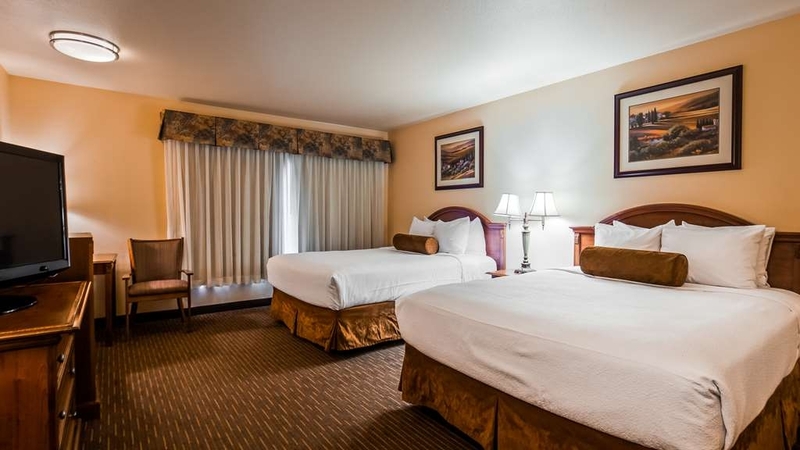 We are happy you enjoyed your stay with us and acknowledged our clean rooms and courteous staff. When passing through again we look forward to serving you. "Way too high for Clearlake"
The hotel is nice, staff is real friendly. But for where it is the value is just not there. The bar closes at 9:00 pm but the pool closes at 11:00 pm. Why? It should be priced at around $99 per night. "Do NOT Stay Here! RUUUUUNNNNN!" Was granted lake check out. Left in the morning for coffee and put do not disturb sign. Came back to shower and my sign was taken off. The room was beginning to be cleaned. I loaded most of my stuff in the car when I left for coffee but still had stuff in the room. Spoke to manager who basically told me to go *bleep* myself. He acted like he was doing me a favor by going back to the room to retrieve rest of my stuff and to shower (check out time promised waa ar. 1, I arrived 12:20). While stripping naked for shower, maid came into the room. When I was speaking to locals, they told me never to stay there and that locals stay away from this place. Hands down the worsf Best Western I stayed in (mostly due to horrible service and experience). Oh and the room I stayed in, there was this continuous buzzing noise that went off every 20 seconds (noise like vibrating cell phone). Was told they can't do anything about it. Stayed up all night even though I was super tired from all day drive. "The Only Hotel In Town"
This is the only hotel in Clearlake, CA. Yes, there's a Travel Lodge down the road, but from the looks on the outside, I wouldn't recommend. Stayed 15 nights (working in the area with others due to the wildfires). While I had a good room, one co-worker checked out after one night and drove to Middletown for the same duration as I. The hotel is old and the side doors are unlocked - meaning you don't need a key to go in/out. Not a secured feature. 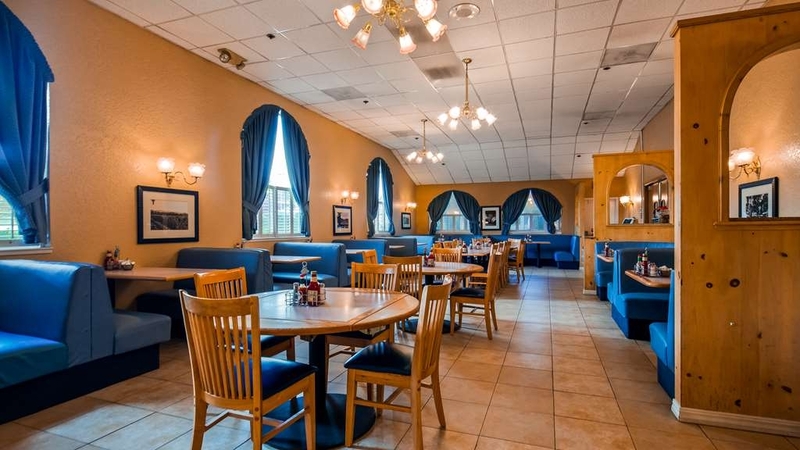 Has a restaurant serving breakfast and dinner (rated in another section). Food was good and simple. My room was clean and spacious with a large TV and an old-fashioned desk for PC work. Old chairs in the room needs updating. Bathroom was OK; shower had good pressure and hot water. Toilet needed two flushing on occasion. Would I return and stay here for pleasure? Not sure. "insulting arrogant front desk woman"
Stayed at El Grande Thanksgiving night. Have been there before and it has been good; however, last night I was cold and needed another pillow - looked in the closet where you normally you would find extras, but there was none. I called to the front desk - phone rang 25 times - no answer. This was about 6:30 pm. Waited another few minutes and called again - no answer - so I went down to the front desk Cynthia was reading a book and seemed miffed that I interrupted her. I then requested a pillow and a blanket. The woman at the desk (Cynthia) said ö Dear my housekeepers just went home." Said I didn't need a house keeper I needed another pillow and a blanket. She said you should have looked in the closet that's where they are. I advised her I had already looked in the closet and there were none - the housekeepers had probably not checked the closed after the last guest left. She asked me three more times if I was sure there was none in the closet. I assured her again and again that there were no extras in the closet. (Should have made her go up and look for herself). She finally huffed and puffed and left the room to go back into the office. The guest standing next to me - said I cannot believe what I am hearing - what charm school did Best Western send her to? Back Cynthia came with a pillow and a blanket. She then said "these had better be in the room when you check out tomorrow and the housekeepers will be checking" I took them and left. Mind you I am a 76 year old woman and my husband is 80 - we have enough money to buy all the pillows and blankets we want or need - we have never stolen anything in our lives and we have to put up with this arrogant woman who is supposed to provide service? Best Western owes us big time apology and she needs to be fired. I know Lake County is not the most populated or most wealthy county in California, but they can certainly find better employees that she is. I might add the little waitress in the restaurant is everything Cynthia is not. Not sure we will ever stay there again. 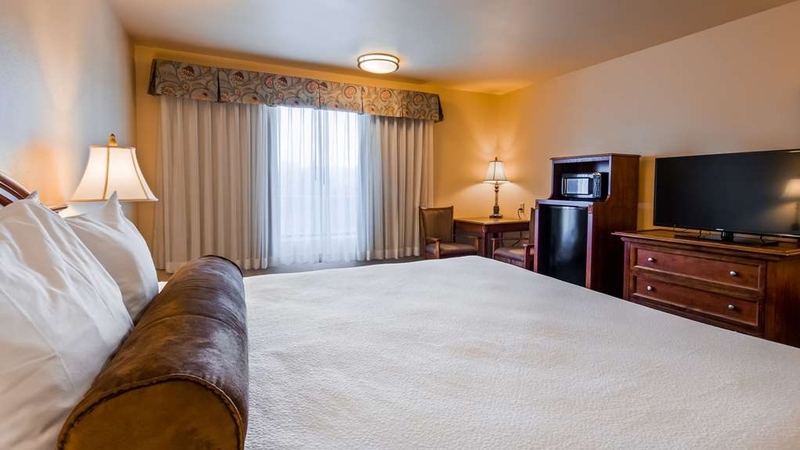 "I believe this is the best Best Western Inn I have ever stayed in ........"
We went to Twin Pines Casino and then decided to stay but the hotel at Twin Pines was sold out. It was this or The Lamp Lighter Inn down the road.....while this place was a little more was well worth the expense as I felt safe and comfortable leaving my car in the parking lot while we were here. The hospitality was excellent and Brandy at the front desk who checked us in was very warm and welcoming. Great customer service! I really didn't want to leave....great room very clean and the water fountain was beautiful and peaceful. "The owner is a jerk"
The owner will call and harass you. Tries to make you pay for extra nights. Probably the most rude person I have ever met. He yells at his employees, treats them like trash. Do not support a horrible person like this. "my stay In Clear lake"
Of the hotels in Clear lake, this best western is the best over all, the other hotels are far less nice and I had a great stay. They don't have a free breakfast but have a restaurant on the first floor, indoor pool and fitness center. "If you must stay in Clearlake, this is it ...."
The hotel itself is fairly nice and is located within walking distance to a supermarket, Chinese restaurant and some fast food places. The front desk staff could use more training in checking in / out guests. They should also ask if a room with view is needed or wanted. The wrong account was charged and I had to contact the Manager two days later to get it rectified. The fitness center, indoor pool and outdoor jacuzzi are nice; they were on the small size. Hence, it is good only if there are no one using them. I worked in Clearlake for a month. I was totally not expecting, but was very grateful for the personal service extended by everyone at this hotel during that time. The rooms were spacious, furnishings of very good quality, the attached restaurant and lounge were very good, accommodating all my special requests. This hotel provides overall good service. With the lounge in the restaurant inside, and the lake walking distance away it's a perfect getaway for a family. Some of the locals are a little bit standoffish but overall friendly. There are many many many restaurants to choose from in the immediate area of the hotel. The lady at the front desk when I checked in seemed annoyed that I got my room online. She mentioned it several times, like it was a huge inconvenience to her. The room wasn't cleaned very well, there was a bandaid wrapper on the floor behind the nightstand. Also there is a ton of street noise, I don't think it matters what room you're in, the noise was really loud. When checking out, another lady seemed annoyed by my booking of the room online, she stated "Expedia will send you your receipt." Which was annoying to me considering I didn't even use Expedia. Had a very good stay at this hotel. 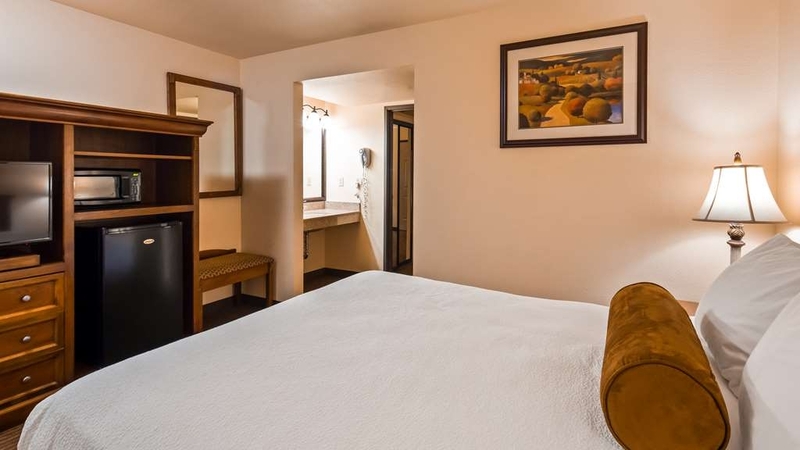 We have stayed at many different places in Best Westerns, and have never had a bad experience. 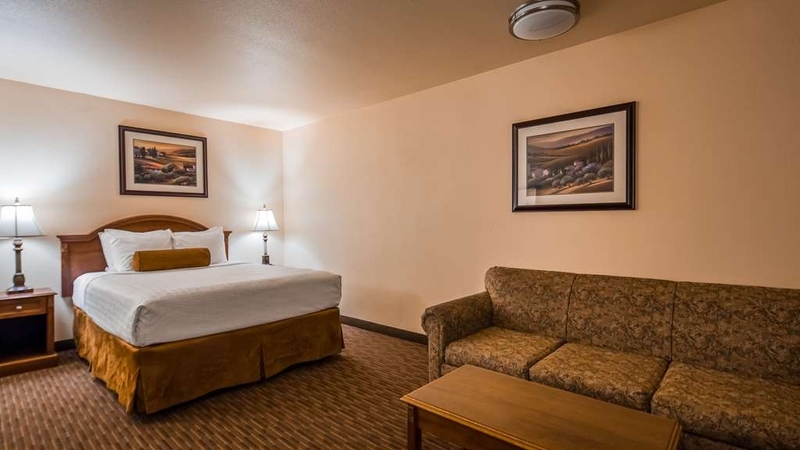 Clean rooms, professional staff, good breakfasts and reasonable rates. This is not we would call a modern hotel. Back in the 70s it would be acceptable, but not now. Small indoor pool and a tiny splash pool outside. Poor restaurant for dinner and no breakfast. They want me to say more but what more is there to say? This is an atrium hotel. Noisy all the time. Too many kids! The pool is indoors so the noise reverberates LOUD!! Don't get a room at the back of the hotel where the outdoor spa is located - NOISY!!!!! "Beautiful hotel. Everything you need." This hotel looks brand new. Staff is very friendly and helpful. Very nice lounge and plenty of room to sit down with associates. Attached restaurant shares the friendliness and also has a good variety on the menu. I would definitely stay here again. The best thing about this hotel are its employees and the owner who provide exceptional customer service. We were stranded in Clearlake, CA for 2 days as our vehicle broke down and it was a very stressful experience. This hotel helped us feel safe and comfortable during our stay. This BW inn isn't up to the usual BW standards. The noise from the hotel's A/C plant is unbearable if you are (as I was) on the top floor. One of the two elevators wasn't working. Breakfast was offered a la carte at the adjoining restaurant. As a meal it was satisfactory, well-served, but an unexpected additional expense. Caveat emptor. Upon my arrival, I was greeted by Avril, who was definitely a shining star at this otherwise odd hotel. She was one of the best hotel staff I have encountered anywhere in my travels: warm, welcoming, helpful. This hotel is full of contradictions: it is the open-center style, where the rooms are off of walkways that surround the central, covered "courtyard", which I find delightful. It gives one the feeling of space, yet warmth, with the beams and Spanish-style chandeliers. However, the front door is dirty, yet surrounded by a beautiful tiled arch. The elevator is downright scary, yet there are no stairs to access the upper floors. There are stairways exiting the upper floors, but they are all EXTERIOR, so that, should you go out, you have to go all the way down to the ground floor to get back in the hotel. In the central "courtyard", there is a very pretty fountain. There is a bar (with a great choice of microbrews and a pool table), and there is an expensive restaurant on premises. Apparently there is also a conference room. THERE IS NO BREAKFAST INCLUDED WITH THE ROOM. The small pool is inside and yellowish and dingy. The rinse-off shower nearby doesn't work. The jacuzzi (outside) is cold and poorly-designed: the configuration makes the water splash up all around the edges, and while your hair gets soaked, you can't get a jet centered on your back. The rooms are clean and updated. There is a microwave and fridge with freezer. Be careful: the fridge is very cold and will freeze some liquids. I also have to add that there is parking on both sides of the hotel, and although they have cameras, I was nervous about leaving my car parked there given the neighborhood. This hotel has so much potential; I hope that someone makes some small changes to bring it up to the standards of other Best Westerns, and to capitalize on its good "bones". It was a busy weekend at BW. There was a bass fishing tournament in town, and we had booked 11 rooms for our party in your banquet rm. So, the hotel was buzzing. I was very disappointed that the bar closed at 10:40 pm on Friday night. And on Saturday night it was closed before 10: pm. Also, one of the two elevators never worked, while the only other elevator frequently broke down, leaving people stranded inside. This could be a very nice facility if it were managed and organized better. The restaurant staff was excellent. Maintenance was ok. Front desk was ok. Very clean rooms, good food, and quite. Customer servive is great. The El Grande is located in the center of Clearlake with Walmart near by and foods market just across the street for your snacks. The restaurant is located coveniently just across from the lobby and the food is great. Stayed here overnight after a long day on the road. Service was standard at check in/out. Room was clean and bed was comfy, although not the quality pillows I've come to expect from Best Western. They were pretty lumpy. Room was nice and spacious-almost wished there was one more piece of furniture in the wide open corner I had, but that wouldn't make any sense. My only negative is the decor. It is ALL dark brown, so even with all the lights on it felt like I was in a cave, even in the morning. Don't know who made that decision when they last repainted, but could use some brighter colors. Bathroom was clean with a few specks of grime. I really liked the large atrium they have here-was not expecting that. "El Grande Inn 15135 Lakeshore Dr Clearlake CA 95422"
No printer in working condition, The swimming pool chemicals were way too much, that I had to get out after 5 minutes and shower. Hotel billing was wrong. My co-worker was charged one price and I was charged a different price. Staff (X4) did not know how to apply Best Western Rewards to billing, Stated that only Manager can do the changes. Accidently left my razor in the shower, Called back and notified Staff, left tele. Number, no return call. Called back next day and was told that it was not found. Very good property, staff is very good and hotel is clean. Rooms are clean and comfortable. Could use some updating as some of the hotel components have a lot of mileage on them. Carpets could be replaced. 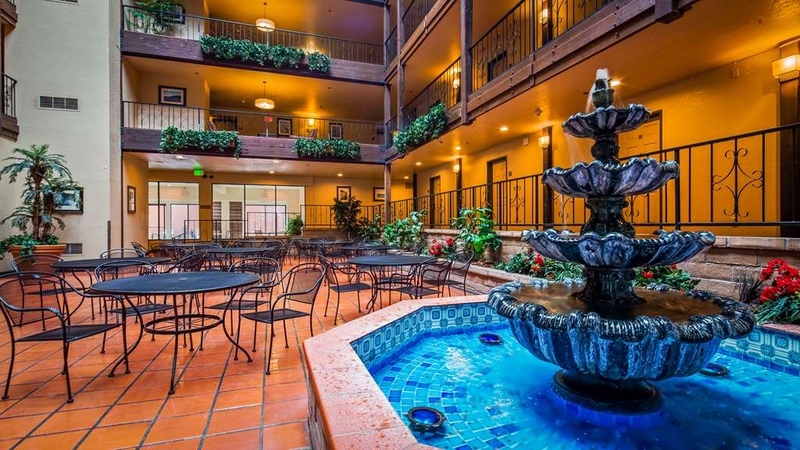 This hotel has nice rooms with all the amenities and is in a 4 story building built around a large atrium with a pretty tile fountain on the ground level. There is a large hot tub also which we did not use but which seemed appreciated by other guests. There is not much going on in this town so this was the best place to stay. It has a restaurant that we only used for breakfast the next morning. We drove 45 miles over tortuous roads to Calistoga (where we had wanted to stay) for dinner and back again! The drive around the northeastern side of lake was pretty...we didn't go more than 7-8 miles since we were headed the other way. On my arrival day at 4 pm after 6 rooms and 1 hr later finally got my suite. All rooms weren't ready for customer check-in. Me and my family were dissatisfied with this issue. No extra pillows available or cribs even when requested ahead of time. Manager never talk to me face to face and any kind of compensation for this inconvenience was issued. Worst customer service ever had at Best Western hotel brand; nobody gave the extra mile to provide customer satisfaction. This is a really nice hotel and the staff is excellent. The restaurant is great also...very well done. The only drawback is the pool/hot tub set up....way too small and one is outside and the other is in.....designed poorly. As a mining inspector I have stayed at this property about 6 weeks now. When you are in the area this is a good place to stay. Enjoy Clear lake is known for the great fishing. Enjoy the travels. You can go east or west to many destinations that are just a few hundred miles. 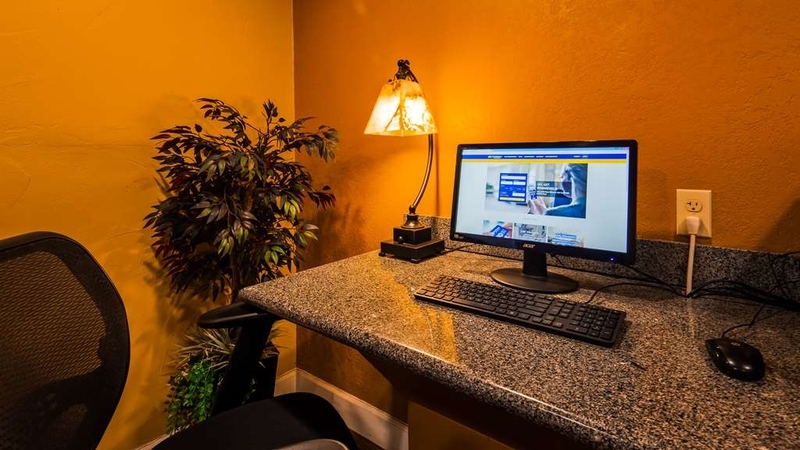 "Great place to stay in Clearlake, CA!" Had one of the best hotels stays at the Best Western in Clearlake, CA. The lake smells lol but the hotel is definitely very very clean. The bed was great, I fell asleep fast and the room was super clean. Kristen was also extremely nice and helpful for us. Give her a raise! Everything was wonderful!! Lovely room. Very clean! Front desk was staffed with great people. TJ was so very helpful. Thank you TJ! Resturant had a great breakfast. We will be back. Great place...great price!! 137.50 for cracked bathtub, no breakfast and filthy furniture ( sofa bed). Used to tolerate at 90 a nite. Just last year. Overnite visits for work will be elsewhere from now on. I am a platinum or diamond rewards member and have stayed at many BW's. This is the worst. "Staying all week and had a good time"
The room I stayed in was very nice, well taken care of each day, and I had a great view of the trees and I could see the lake on the side. There is a nice pool and a good restaurant too. There are nice places to sit with other people (doesn't have to be in your room). Have stayed at this hotel for many years while on business in the area. Consistently well trained, friendly and caring staff. Hotel amenities progressively upgraded last few years. Very good internet now, even new carpet this last week. Clean, convenient place to stay. "Came for a Court Case"
I had to travel from Los Angeles for a small claims case against someone who lived it the Clearlake area. I had mistakenly booked a room in Healdsburg not realizing that the court was 1 1/2 hours away. I called the court and they suggested the Best Western El Grande Inn. I was really happy with this hotel, interior looked like a Swiss Chalet with a small fountain in the court yard. The front desk was very welcoming and the room ,418 I believe, was quiet. If I am ever in this area again I will defiantly stay here. "Overnight stay due to landslide"
Check-in ? Out was great and very helpful, Rooms ok clean but had a big stain in carpet approx. 12-14" round , TV reception wasn't the best , program would freeze or get a notice to call front desk .in the a.m. water pressure was bad couldn't almost use the shower. The rooms are good size and nice and clean. The customer service is very lacking and they could make people more comfortable about security since they have cameras that do not show much except the entries. The desk clerk could not tell us how to get to our room and they do not really seem to care much about the guest. I gave it an average because it is better than most in the area but not what I expect from BW staff. The drive is about a good 45 minutes or so west of I-5. Well worth the drive. So scenic, peaceful and relaxing. Clearlake is a beautiful small town with one of the best hotels in the entire nation: Best Western. The staff is ultra friendly and helpful. They greeted me and treated me with the utmost kindness. I like that. The room itself was incredibly cute, clean and I immediately felt right at home. I loved it! The room I had was nice with a good view. The restaurant attached to the hotel is good, get the breakfast burrito! I would have liked more water pressure in the shower. But other than that, great room in a good location. "Horrible beds and wouldn't refund last night of reservation"
I wanted a get away and relax for the weekend. This was all I could find at a reasonable rate. We got in the room and it was chilly. The heater didn't work. They did fix it the next morning. The room was ok. Looks like they updated first night, all I heard was sounded like someone in a room below mine left the bathroom fan running all night. The bed was not comfortable at all. So much for relaxing. The second night wasn't any better. I had enough. Not relaxing. I asked if I could get my last night refunded. The guy at the desk said there was nothing he could do because I booked it on Expedia.com. If I hadn't he said it would be no problem to refund it on his end. Mi said so you will refund it if Incontact Expedia and he said yes. So much for that. I called Expedia and they put in a request and the hotel refused to refund back my last night. I think that's pretty bad. I don't care for Best Westerns to begin with. I will never stay at this one or another one again. The area this one is in, is not in the greatest part of town. We needed that vacation so bad we had an excellent time it was an excellent hotel the best Westin L grande thank you so much for everything we had fireworks we soak in the sun and everything was perfect thank you thank you for everything. "Surprising stay in Clear Lake"
Very conveniently located,we were going to Middletown to dance at the casino. Located in a nice little town. Hotel was nicely decorated and staff was very friendly. Small pool and lounge for the amount of people staying here. The food in the restaurant was excellent, we had dinner and breakfast there. This is the final review of a series of reviews that documented a road trip between Tennessee and California. 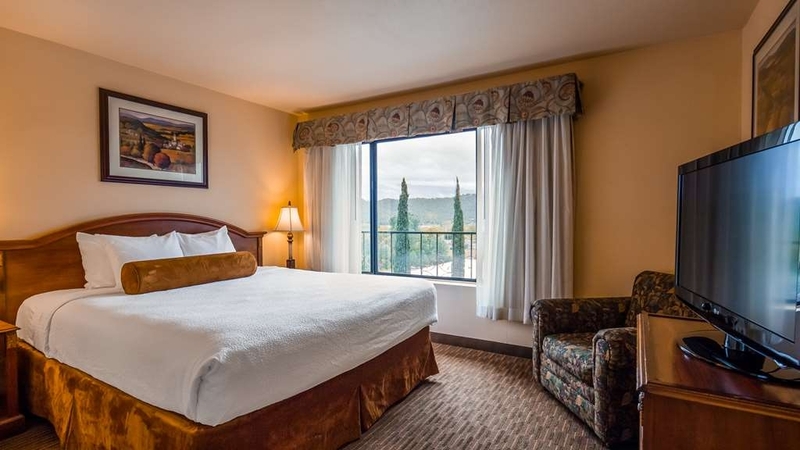 Outside of using airbnb or staying at a B&B, this hotel is the best bet in Clearlake/Kelseyville/Lakeport. It was a big step up from the night before in Lakeport. Front desk personnel are friendly and efficient, and all seem to know someone in the wine industry. The room decor is somewhat dated, but for some crazy reason the interior courtyard reminded me of Hearst Castle. You access your room via a hallway that overlooks the courtyard. The bathroom is bland but had plenty of towels and hot water for two people. There is Spanish tile and greenery in the lobby and courtyard. There is also a small business center. Plenty of parking. The hotel is close to CA-20 and within 20 minutes of several wineries. If you are driving to I-5 and you need breakfast or coffee or gas, be sure to get it before you hit CA-20, because there is nothing on CA-20 between Clearlake and the Shell station at the I-5 junction (35 miles away). Good value! Acceptable Best Western but wow it needs a renovation big time...furniture is from 1970's. I appreciate the accommodation from the front desk as they gave me a top floor corner room...thank you! But the owners really need to step up and put some $ back in this place. No free breakfast and Internet was fair. "Best place in the area"
This is the best hotel in Clearlake.There was a lot of street noise especially a metal plate in the road in front of the hotel. Ask for a room near the back of the hotel. There is a decent restaurant on site and bar. The room was OK. Bathroom light kept coming on by itself all night. Staff was friendly and helpful. 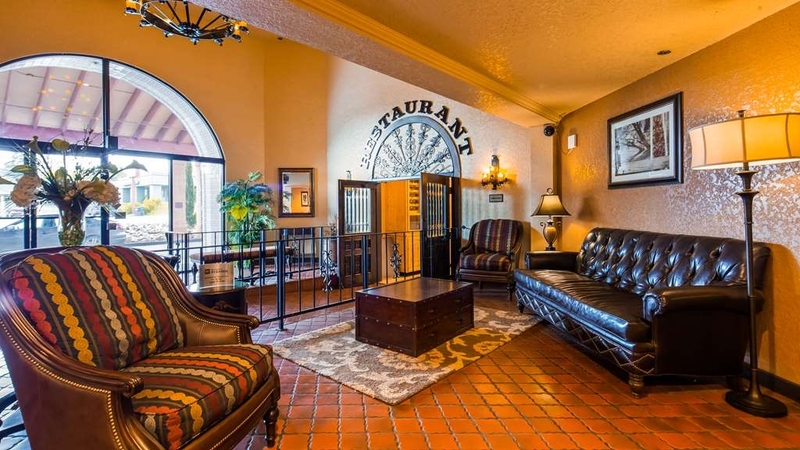 Great hotel great staff, great restaurant, Very comfortable and quiet, I would highly recommend this hotel to any travelers looking to stay in the Clearlake area. the staff at this hotel was by far the best I have experienced at any of the Best Western properties we have stayed at. "Clearlake was a murky stay...."
Our non smoking room reeked of smoke! Terrible customer service. Could not be moved since hotel was full. The desk clerk could not make any adjustment to our bill. Finally, he called the owner who took off 10 percent. Had to have receipt emailed to us because desk clerk said the owner himself had to make the adjustment. I expected a comped might. We arrived very late and could not find room at another hotel. Very disappointed with this Best (worst) Western. I called corporate to report this bad experience and they offered a small check to compensate us for poor experience. Do not stay at this hotel! Also, the sheets were old, curtains stained, and bathroom tub dingy. Clearlake was a murky experience for us. 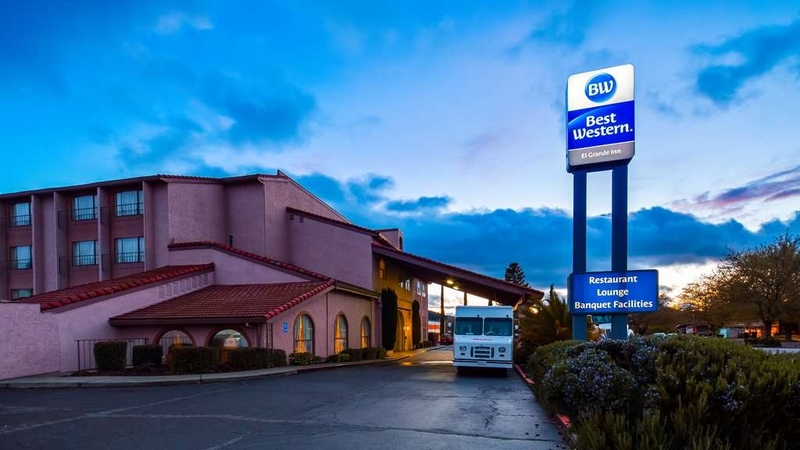 "Best Western's El Grande is the Best In Town"
The El Grande is the largest and best hotel in the town of Lower Lake, CA and well worth the price! The rooms are spacious and quiet, and the restaurant serves good food at a reasonable price for breakfast, lunch and dinner. Room upon entering is very clean, linen is very clean and inviting. Bathroom is very clean, water pressure is low. Beds are comfortable and pillows soft. Cable tv is clear good picture. A/C works like a dream and thermostat isn't preset so you can lower temp as low as you want ( 106• today in Clearlake ) parking is all around hotel with cameras. No pets allowed, indoor lounge and sit down restaurant. Very friendly staff. Indoor heated pool and outdoor jacuzzi. "Good hotel if you do not want conveniences"
While the Staff was great and the hotel was clean the services that you expect from Best Western was not there. If you just want a base station for a trip this would more than due. If you want email access look for different area if the staff can be believed. Wifi was only .5Mbs down. Not even good enough for email or any other usage. I was very impressed with the cleanliness of the hotel. The suite was average but the bed and pillows were very comfortable. Also, note that the "lake view" is actually beyond a parking lot and in a distance but there is view of the lake. Overall, I was happy to find this place and I would stay here again if I find myself in the area. Small but nice suite. All the usual amenities. Convenient location. Four levels with two elevators. No free breakfast but have their own dining room. Good for breakfast menu and fast service. Biggest negative was slow check-in line. Only one person on duty. Best location in Clearlake for travelers. Hotel staff was very nice. Rooms were very clean, kids swam in the pool, we had a wonderful time. We came down for the weekend to visit family as usual every year, we love coming here to stay, wouldn't stay any where else. 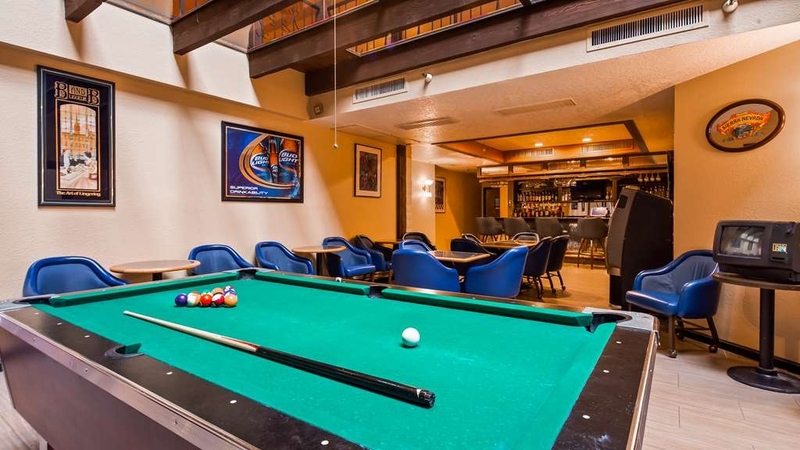 "Pool, hot tub, restaurant, Checks all the essential boxes plus a modernized bar area with pool table! Wifi hit & miss." We have been here for 3 days so far with 1 more night to go, and it has been a great hotel for the price! This is our first visit to Clear Lake to potentially buy a summer property. The hotel is older but it has everything a family needs and does it well. So many hotels today miss some of the basic amenities a family needs, but this one doesn't. Pools - We are in the indoor pool area now and it IS tiny, but it does the trick for my family. I did 20 laps in it! (Lol). The hot tub is outside and covered with bugs. With no one here to service or clean it, and no visible net, I had to scoop them out before we could use it. It was not hot enough and not clean enough. Seems like they need to have someone include a quick scooping/cleaning to the hotel rounds twice a day. This would take 10 minutes max and solve a problem painlessly. Food- We have eaten every meal in the restaurant and the service and food is much better than expected. Everything has been delicious. In fact, we have eaten breakfast here every day and will continue to do so. We ate dinner here last night too and that reminds me, you can order in the bar area if you want. Very cool. Huge flat panel TVs in the bar area. This is 5 stars for sure!!!!! Room- The room walls are a bit thin but fortunately there is a fan that runs all night if you slide it over to ON. We all slept well to the humming of the fan! The beds are comfy and the standard room has everything - fridge, microwave, flat panel tv, and hot shower/bath, ice bucket (don't see those much but it is very nice when you are near a lake!! ), desk with chair, charging and a small separate bathroom area for putting on makeup etc. The a/c is extremely efficient and the showers get hot and stay hot for all 4 of us. The wifi is excellent downstairs right now near the pool area and in the bar area but not in the room. Bottom line - I will stay here again. It is an incredible value. "Convenient, and VERY GOOD, overall." Recent stay was my 2nd stay there, and I will again. My husband and family I visit nearby, especially appreciate the nice restaurant and lounge. 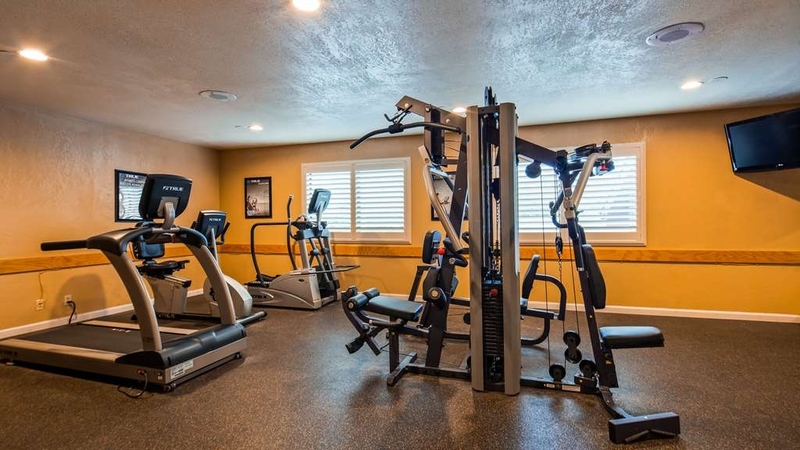 It is convenient location to everything we need in the area. "A nice hotel in a nice location." 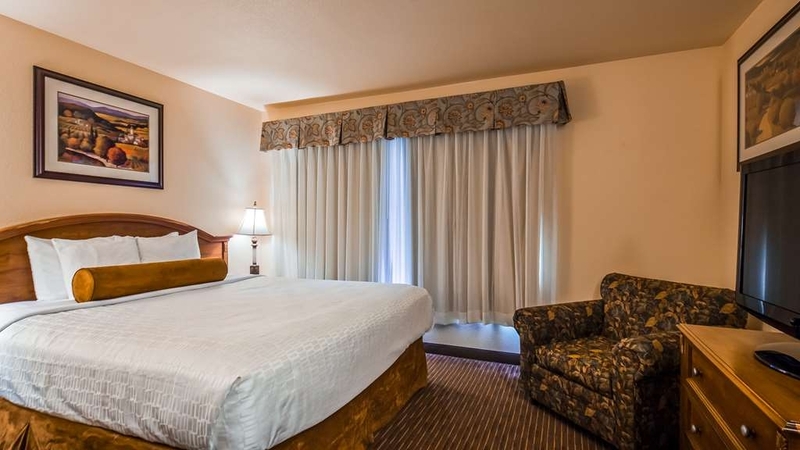 Conveniently located just a block or two off of highway 53, this hotel is withing walking distance of beautiful Redbud park, a grocery store, a few restaurants, a gas station and more. 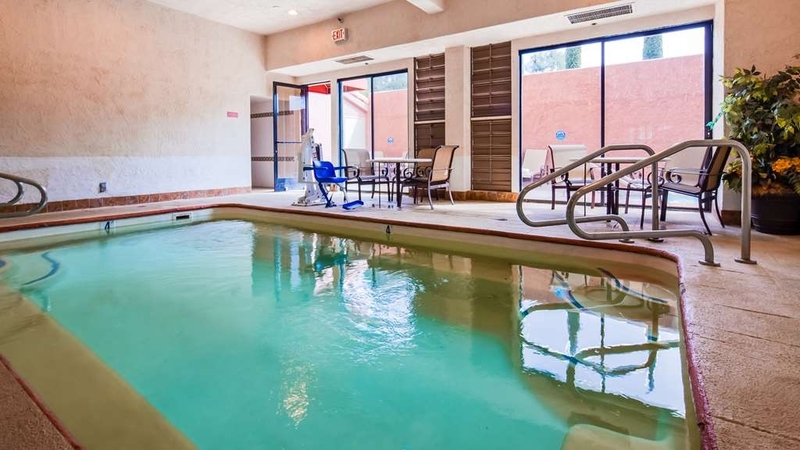 It was comfortable and quiet, has an indoor - though small - pool and a nicely heated spa (with a shower right there to rinse off that chlorine before heading back to your room). The interior has a center courtyard with tables, there is a restaurant and bar in the hotel. The staff was friendly and there is plenty of parking. This will be my go-to hotel for visiting my family, who live in the area. I thought the room was a bit overpriced since they don't offer any sort of breakfast other than the restaurant inside the hotel which you have to pay for with no discounts. The hotel staff was friendly, but we did have an issue with one of the cleaning staff who was a bit rude when asked if our room was getting clean towels and trash emptied. The refrigerator did not work, but was promptly replaced, we also had an odd smell to part of the room. The bathroom is on the small size with water pressure for the shower too low. On the positive, the bed was comfortable. "Clean, average Best Western with zero extras"
Requested a top floor room, was told that those rooms cost more. No breakfast included... Room was clean but dated. Has microwave and fridge. Actually more than I expected for this small town. First hotel I have ever stayed at that does not have security card entrances on the rear and side doors, anybody off the street can just walk right in the halls etc.? This is why I always try and stay at a BW Plus or Premier property. It's the detail. Except for the fact that one of the computers in the business center wouldn't work, this hotel does everything a hotel needs to do in a location that has very few decent accommodation choices. The room was available when I needed it, it was clean and comfortable. The restaurant is very good for both breakfast and dinner and it has the normal amenities for a hotel of this category. I will stay there again if ever in Clearlake, CA again. "Noisy wedding party shook hotel." We provided free dental care all day here in town and we're very tired. We arrived at our 3rd floor room about 6:30pm and the disk jockey was at full blast on first floor of atrium The hotel is atrium style with rooms surrounding the open area from 1st floor to 4th floor. The hip-hop bass beat reverberated so bad in room 308 we could not understand the TV from our bed. Front desk did not answer multiple times. Finally reached front desk via cell & outside line. Party was to last till 8:30pm another 1.5 hrs "I'll ask them again to turn down the music." Fortunately they quit at 7:36 pm For 135/nite+taxes. I expect a quiet room. Otherwise: Room was fine. Bed very comfortable. NOTE: NO FREE BREAKFAST North elevator failed today. Trapped a guest Friday evening. South elevator feels "SQUISHY" when you step onto it. Room smelled of fresh smoke and bed spread looked like someone had been in the room just before my arrival. I called the night time front desk to change rooms. They was unwilling to help provide a non smoking room. I was told that the hotel was sold out. Front desk person in the morning upon check out told me that they had vacancy the night before. "Recommend to your enemies that are allergic to cigarette smorke"
If you have enemies with cigarette smoke allergies, especially from the nickle in the tobacco , recommend this hotel to them. 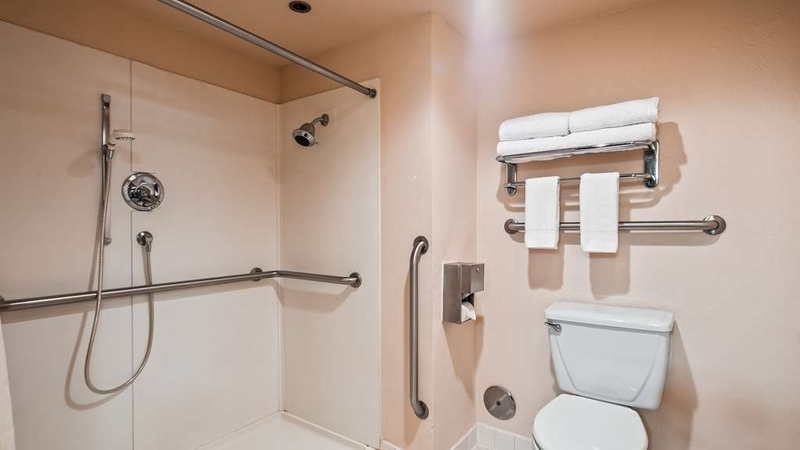 The first non-smoking room caused me to have an asthma exacerbation while sitting in the bathroom in the tobacco smoke reeking restroom, which almost ended up with me having a trip to the hospital. If it wasn't for rescue inhalers, I wouldn't be typing this. Second room was fine till you turned on the heater, which has cigarette smoke heavily inundated in the filter to the point where I'm taking many more hits off my inhaler in an hour than recommended by the manufacturer. Currently, I'm weighting the costs of sleeping in the hotel or sleeping in the car and the probability of surviving either event. If I don't survive the night due to an asthma attack or exposure to extreme cold, I want to thank my parents for my education in mathematics and everything else they've helped me with over the years. On the bright side, the internet works well enough for me to write this review. Also, the TV programming seems good. It'd be a pretty quiet hotel if I wasn't wheezing. I have stayed at this hotel numerous times. The service is good & the rooms are comfortable. The rates are a bit high for the area, which is horribly run down. Clearlake used to be a nice place to vacation, but the area has very high unemployment and lots of empty businesses. Since we have family there, we still go up occasionally, but the crime rate is high and the town shows a lack of pride. Unfortunately, this hotel is slowly becoming trashy outside and old looking inside. "Double Charged, and wrong room!" Staying in Clearlake, CA for business. After driving 2 hours from Sacramento (white knuckled down the dark highway from I-5) alone to get here at night, I figured that I would be able to relax. I was wrong. The front desk person said my card that booked the reservation on Expedia was declined, and that they had to charge me again. I called my husband, verified our bank account was charged, showed the receipt, and he still insisted he charge me, and that I needed to call Expedia myself to settle things and then the charges will be removed. At this point I have no patience, and told him he needs to contact Expedia and figure out why they aren't paying them. As the tired customer that already paid a month ago, I told him the issue was my card expired, and was issued a new one (same number), but the charges happened when the card was valid. Not my problem. Apparently it was my problem, and he refused to give me keys unless I give him a card for the file. Figuring it was for incidentals, I agreed, and he then gave me the receipt showing they will charge me in the morning. I chewed him out, went to my room, spent an hour on the phone with Expedia (who refunded my original charges, and gave me a $50 gift card), and told me to pay the new charges, if that was acceptable. I don't have a choice at this point. All said and done, it was an error between Expedia and Best Western, but the front desk didn't even attempt to help. He basically said to pay again, or you can't stay here. I asked for the manager, and there wasn't one tonight. I will be speaking with one tomorrow. The kicker...after winding down, getting relaxed for the night, I realize I am not in the room I booked (king room). I am typing this on a queen bed. Too tired and annoyed at this point to want to change rooms. I wanted to stay at a branded hotel for my business trip. I should have taken the hint when the property was listed 3 out of 5 in Clearlake. Our stay was marred by incompetent staff, (check-in rate was $10 more than quoted, tried to charge for 2 nights instead of one, failed to credit us for our BW points and put us (and charged a premium) for the smallest suite I've seen. I made reservations for two nights through the hotel directly. When I made the reservation I told my wife, I thought it was the girl's first day.. She apparently did not note that it was for two nights. When I checked in I experienced the same incompetence. The rate was much higher than I agreed to and I caught that. I didn't catch the second night error. I could accept that as my error. What I couldn't accept is the way they threw us out damaging our possessions and the rudeness. It was not to be believed. "So incompetent and unprofessional "
I travel all over the country staying in hotels and this is one of the worst experiences I have had with a hotel. From the very first time I walked inside to check in there was drama. There were intoxicated people in the bar area yelling and cursing. My first thought was that the hotel can't help rowdy guests from time to time. However once I overheard the conversation about it between the waitress and the front desk ( I still have yet to even be acknowledged that I'm standing at the front desk) I find out they moved the screaming guy back to the kitchen. Employee of the month I guess. I have been jerked around with my room every single day. Check out and check back in. After being told by one guy I have a room for a solid week, upon checking back in we find out there is already someone in that room and last straw is they just phoned me to tell me I have no room at all now. Some very incompetent staff. This is a nice hotel for the area. The beds are comfortable, rooms clean, and staff helpful. We ate once in the restaurant, which was quite acceptable. We were visiting family nearby, so it was a convenient location. Due to a fire in the area, I thought the prices were elevated more than the 10% allowed. The room rate I booked was $134, but the same room the next week was $99. As a Diamond rewards member I was given a 2 room suite for $109. Being a rewards member makes all the difference. Very nice staff and comfortable stay. "Great room, enjoyed the restaurant"
Visiting on business for a couple of nights, this was the perfect place. Good location, onsite restaurant, nice rooms. Staff was attentive, food was good (and there were several options for vegetarians), enjoyed our stay. Even ate dinner in the bar one night, they were also very attentive and helpful.